Relax and let the bObi Classic clean up any messes in your home. 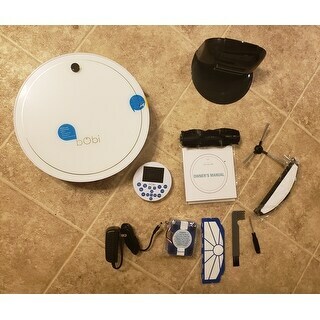 This cleaner can adapt to a variety of flooring, and the remote allows for a programmable cleaning schedule, so you can sit back while the bObi handles the work. The obstacle sensors prevent harsh bumps and damaging drops, while the cleaning technology ensures a pristine home. Dimensions 12.6 In. X 12.6 In. X 3.4 In. The bobi has been a blessing to our home. My wife and I are both senior citizens and nothing is harder than cleaning the floors. We have 2 beautiful German Shepherds than we absolutely can't live without but cleaning the hair was becoming a nightmare especially after my recent knee surgery. The Bobi has been more than a blessing and I can't recommend it enough for people who have pets or have a hard time vacuuming. It is really easy to work with and was much less intimidating to set it up than I thought. We have given her a schedule to clean every afternoon at 5pm which is when we are usually outside. 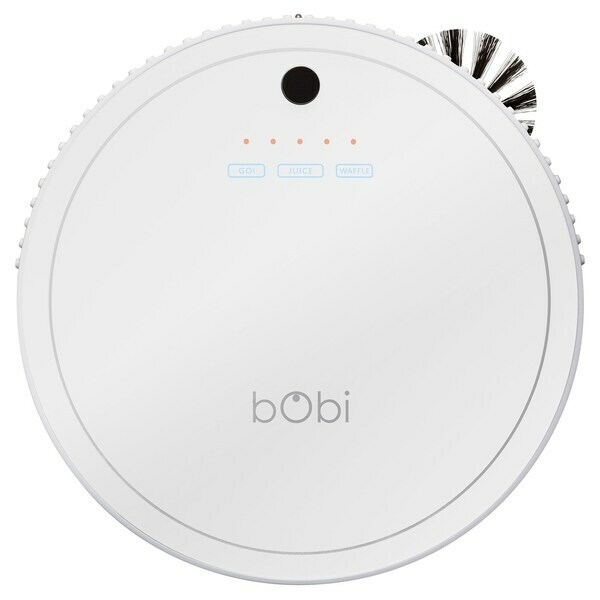 The bobi goes around on its own and we come home to clean floors. We had a shaggy carpet that bobi got caught on a couple of times so we gave it to our daughter and got a regular one instead but that was well worth it, considering the help we are getting. The bin and the brushes are easy to remove and we dump a good 1-2 cups of hair after each day of cleaning. Thank you for this wonderful product. We've had the robot vacuum for a couple of months now. All of our floors are hardwood, tile or short carpet. I would say it picks up about 80% of debris on the floors and lasts about 2 rooms worth of vacuuming. Out of the 20% it doesn't pick up, this mainly is around the dinner table where it gets confused with all the chair legs. It fits well under all of our furniture, but sometimes gets confused when it encounters a chair leg or a piece of furniture where the bottom of the furniture is at the same level as the sensor. In this case, it gives up after a little while. Most of the time it avoids knocking into things. Except the ottoman. It really loves to yard into the ottoman at full bore. The only issues we've had with it are when people leave cords or socks out and that it always tries to eat the bathroom floor towel. When either of these things happens it beeps annoyingly, or I find it turned off when I get home from work. We heat our home with wood and it picks up the pine needles and bark debris well. It also picks up heavy things like chain saw bar nuts and neodymium magnets. I also like the UV light feature because we have chickens. It is easy and straightforward to clean and maintain. It is about as loud as a hair dryer on medium. We don't have issues with the dark multi-colored floor rugs. It cleans these too. Drawbacks: "mop" is pretty much useless. It can be used in waffle mode, but it takes so much time to constantly re-wet the mop and push waffle that I could have just used the swiffer wet mop for the same results. It has made it back to its charging station twice in three months. Usually I find it where it has either gotten lost and died or has had another unfortunate encounter with the bathroom floor towel. This is kind of annoying, but considering it cleans up about 80% of the dirt and pine needles, I'm going to overlook that, because I average about 800 hours of overtime a year and I don't want to spend my precious time sweeping. This is the smartest robot I have ever owned. Not only does it look adorable as it cleans my floors, but it is so smart it is able to just do all the floor cleaning and go back home. I love all the features - like how I can drive it manually with the remote, and how it lets me know if it needs cleaned. We have a very large carpeted family room downstairs where our 4 little dogs run in and out of to play and do their business in the yard, so I wanted something to help with vacuuming and sanitizing. bObi has definitely helped cut down my cleaning time by taking care of those things. I can let her go to work until she runs out of juice and will vacuum the other parts of the house myself. She is great with picking up dirt and dust and I find myself cleaning the dirt/dust/debris-packed filter much more often than bObi's waste bin. (Luckily, my dogs don't shed much.) 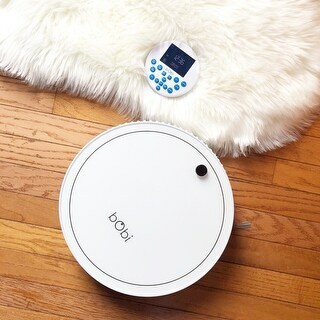 The first time I used bObi, I watched to see how she behaved in certain areas and identified her challenges. Before I let her Go!, I do have to prep the family room by blocking off the couch with baby gates and move some small furniture pieces up and out of the way for maximum coverage. bObi gets confused under our L-shaped couch and gets stuck on a small rubber-backed area rug by the door but since she does such a good job otherwise, it's worth the extra few minutes to block her under-couch access and remove the little rug. Since the room is completely carpeted, I'm not able to use the charging base and have to plug and unplug manually - not a big deal. I like the remote, replacement parts and cute birth certificate. I was overwhelmed when I first opened the box, but the manual was easy to understand and bObi was quite simple to set up and use. She works well and does what I need her to do, but is not perfect. Either way, I will keep bObi on my team! Note: The week upon receiving my bObi, a newer version was just released in Nov. 2015. I honestly thought that I could program Bobi -- set it up to follow a track or clean a particular room based on my programming. That's not the case - and sometimes it's frustrating the course Bobi takes -- going all over the place when I just need one hall done and it's going in the kitchen and dining room. That said -- I use it almost everyday - and it is a real time saver -- I set it to cleaning while I do other things dishes - laundry - whatever. I hold the remote to guide Bobi if she starts going somewhere I don't need cleaned. I was pretty excited about the mop feature - but haven't used it - as the way it's configured I don't have much expectation that the mop / sponge would remain wet long enough to clean the spaces I most need done. No regrets. Love that there are not bags or batteries to replace. Overall satisfied. Only thing - thought I would get more entertainment value out of it from my cats but they're really just -- Meh. Fun to watch and it responds to commands. Ok, so you have to use the remote to get it to respond, but it's still fun. This is my new favorite gadget. What's not to love about something that automatically does housework for you? The low profile design gets under furniture and the edges of my cabinets without getting stuck. It's great on the carpets & hard floors. It does tend to "climb" low profile items a bit, and was doing unmentionable things to my dog's bowl, but it stopped and turned the other way after a few brief seconds. The only things I can think of to improve this would be a longer "homing" range. My house is one story and is a long Ranch design. If bObi is too far away from the docking station, he gets lost and can't find his way home....not a big deal, but you will have to find him and physically return him to charge if he's more than 50' away or so. The only other thing that could make it better is if I could verbally control it by saying "hey, you missed a spot", but he normally makes his way back to catch it...I'm just impatient. You do need to secure your lamp cords, etc., off the floor...he will find his way under and around tables to get them if you don't, and he always finds his way out as long as cords are out of the way. If he gets hung up on something, he will scream at your (beep) until you provide assistance. He lasts for about 2 hours before beginning to lose power....the dog dish is jealous, I'm sure. I'm in an almost 3000 sf space, and I run him daily. I never have to sweep now as he finds his way in and out of every room in the house. I haven't tried the mopping feature because it's such a small pad and I'm sure it would be a waste, but as far as an automatic vacuum, this one can't be beat! To tell you this is a great vacuum cleaner is the easy part. It works flawlessly on a given schedule 7 days a week. We have been more than thrilled to have Bobi keep our downstairs tidy. No questions, this is a superior robotic system. What you may not know is about their incredible customer service. Our Bobi had a slight problem after nearly a year of hard work. I called the customer service number and was put in touch with a representative by the name of Anne who helped me put Bobi through a number of diagnostic test. Afterwitch it was determined that Bobi needed to go to their clinic for further testing. Anne set up the return process, the postage and everything I needed to expedite the situation. It was not long before Bobi was returned, completely refinished and ready to go. I am telling you folks, I have never experienced such incredible customer service. This is the product to buy! They mean what they say and they stand by their product! Just started to use. So far so good. have not used the charging station or the remote. Just turned it on and let it clean. Downstairs is all wood with the exception of the kitchen which is stone tile. We have 2 cats. Picked up all cat hair and litter. I was quite pleased. I will update once I become familiar with all the features. I love everything about this vacuum. No more sweeping. She picks up stuff hand sweeping misses and gets under beds and tables. Fabulous. Doesn't do a great job on large wood floor. Mop does not do anything, its a very small pad, not much mopping ability. So far so good with this, it sweeps, it doesn't vacuum as it has no suction, but it sweeps well and gets all the pet hair and dust from a huge room, a hallway and a kitchen in one charge. The mop feature would be ok for a small room, but the mop is tiny and it dries before the room is finished. I haven't tried this on carpet. I love the uv light feature too. in a home with high furniture and no rugs it would be great. bobi get caught on my mid-century coffee table and low sofa's every time. too bad it doesn't have a memory of its difficult places and avoid them. it is easy to program for daily use but getting it uncaught is annoying. i would not order if i knew of the obstacles. I don't know how I lived without! This model is better than most robotic cleaners. At first the vacuum worked very well. When incorporating the mop in the cleaning process, results were limited. I own 3 robot vacuums. I've had Roombas for years. Decided to try different brands in case they were better. Let me say, Roomba rules. The Moneual (my 1st non-Room a was bought from Ebay at a 75% discount. Software was all messed up and then I discovered that the company no longer existed so I had no options. This is my 2nd non-Roomba, and also purchased at a discount. Although it vacuums very well, it requires constant supervision. It tangles itself in cords and stops. The postage stamp sized mop is a joke. When it encounters a stairway it stops, but then just sits. It's thicker than the other 2 and wedges itself under furniture. If none of these situations exists where it will be used, it will do a great job. We returned it after a month because it stopped sucking anything up. It seemed to always run the same exact path and got stuck under or next to everything without being able to turn around. I’ve had this for some time while it does what it says and it doesn’t scare my dog, I still like to bring out my stick vacs. This is best for bachelors pad/not much traffic. But I do like the white color. Have had it for 3 yrs now. I have had over 2 years. The company's customer service is second to none. I have a lab and lots of hair. The tank is not big enough to hold it all but I vacuum first then turn her on for getting under the bed. We have all wood floors and a few rugs. She does not like fringe, shoe laces, or cords. An asset but wont replace your regular vacuum. I used to have a room a. I picked this because of the black light function. However I can’t use it on my rugs as it eats away at the tresses. Other than that it works just fine! Overall great product! Especially for the money. Works great and does a nice job! I would definitely purchase it again. Thank you Overstock. Once again, you have never failed me! This was a gift for my brother and sister-in-law. They love it! "Where can I buy a new Battery for my Bobi, as it no longer holds the charge"
Please contact us at our toll free number 1 (800) 843-2446 and we can assist you. "Can you turn off the UV light if you want to?" Hello Tank, this UV light is not able t be turned off. Thank you for shopping with us. You can turn the UV off. ""Does it work on 220v?"" Hello vinoimp, this item charges on a 110 volt. Thank you for shopping with us! "does this not have a suction? does the mopping feature have a liquid reservoir or do you have to wet the pad?" Hello steve c. Yes, this does have a suction. The mop doesn't have a liquid reservoir, it could be used as a dry mop to polish or dampened if desired. Please let us know if you have any further questions. New baby on the way and wanted some help keeping our pets hair and the dust off of the floors. Couldn't be the 60% off promotion either. Groupon had this for the same price, but there wasn't free shipping. Can't wait to try this out. want a robo vac to save some time.